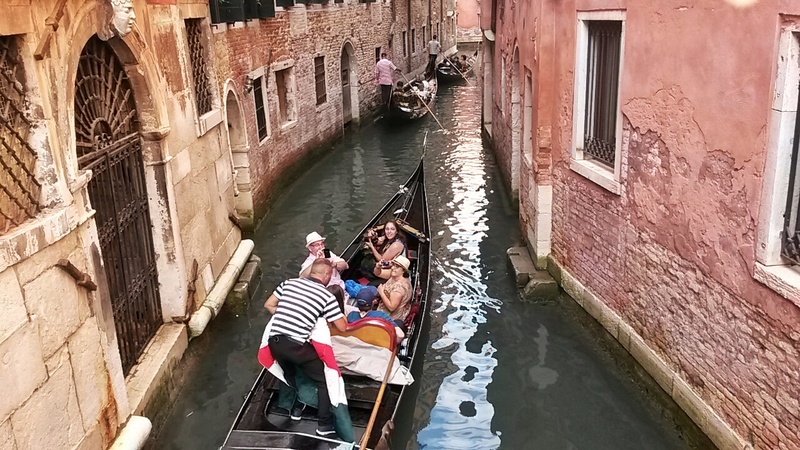 A Gondola Ride Gift Experience in Venice with Tinggly – Why Waste Annual Leave? Considering I am a cliché hopeless romantic, I sometimes find it funny how I ended up with a man on the polar opposite end of the spectrum. Mr Practical (AKA Pumpkin) is not a creature who will whisper sweet nothings into my ear, pen love poems in my absence or assemble candlelit, petal strewn dinners. He is, however, a man who spent most of last weekend constructing a dressing table for me, as a surprise, because he had noticed I put my make up on in a corner of our room with dim lighting; he is a man who senses from my texts when I have had an emotionally charged day at work and leaves a Creme Egg on the kitchen table as a much-needed, sugary pick-up; and he is the life-saver who insisted on staying up with me till 5am, bleary eyed with laptop in hand, the night before our early morning flight a few years ago when a technical glitch meant I was on the verge of losing a year’s worth of hard work. Pumpkin is practical to his very core and shows love through selfless actions. As for the red roses, soppy messages and Eiffel tower kisses, he is quite content with leaving such gestures to the Matthew McConaugheys of the world. Perhaps you can imagine, therefore, what he made of my suggestion to fork out on a gondola ride in Venice this year. We all know Venice is renowned for being costly and gondolas, love them or hate them, are undoubtedly one of the most expensive activities you can experience there. After a few mumblings referring to “value-for-money”, Pumpkin remained sceptical and politely opted out. 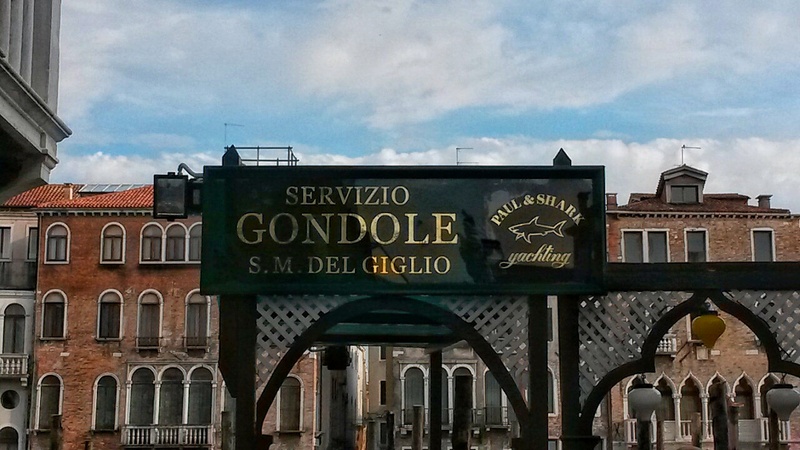 Fortunately for me, the fairy Godmother over at Tinggly sensed my desire to try out this quintessentially Venetian tourist activity and kindly invited us to try out a gondola ride gift experience in Venice, leaving Pumpkin firmly out of excuses! The company that coordinate the gondola experience is used by various other booking agencies and operators so when we arrived, we found there to be a bit of queue, which was perhaps not such a bad thing given that we were running late ourselves and were becoming all too familiar with the feeling of being lost in Venice. As we unintentionally eavesdropped on the British couple in front of us, we learned that Michelle Obama was in Venice that very day. 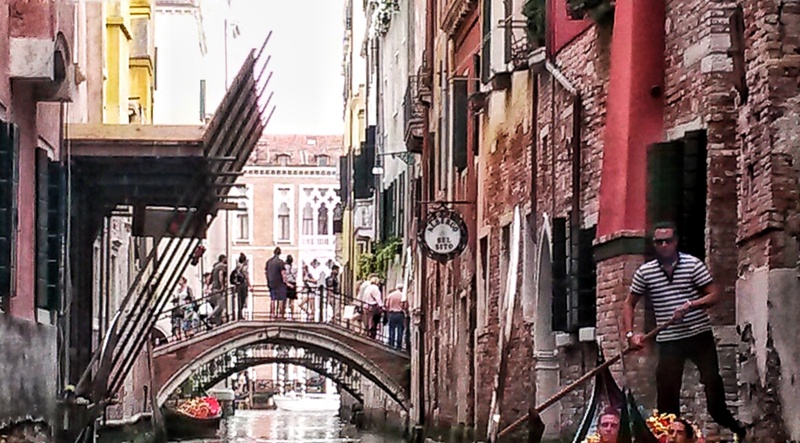 And the next day when we were in Murano, we would see a dense crowd populate one of the bridges. We would walk over out of curiosity only to see the masses dissipating and only then would we learn that we had missed seeing the First Lady by less than a minute. We had already read the fine print so we were aware that this was a group gondola experience, which we did not mind at all and frankly, I am quite certain my practical Pumpkin would have struggled to keep a straight face if someone was serenading just the two of us and lunging long-stemmed roses between us. There were six in our gondola and although we were beaten to it, I would recommend the seats at the back of the gondola from both the comfort point of view as well as for the best photo opps. Four gondolas floated down the Grand Canal together as the sun was starting to set, leaving a peachy glow permeating across the water and allowing us to appreciate the beautiful, crumbling architecture in a new light and with the contrast of the dimmer, more atmospheric tiny canals we traversed. As we had strolled up and down the tiny passage ways in Venice, I had paused to snap away every time I spotted a gondola lazing along a canal, undeterred by the countless other, virtually identical images already stored in my gallery from the preceding days.This time, it was a strange feeling looking up and noticing tourists standing on bridges and balconies staring down at us and doing exactly the same thing, all of us united by our desire to capture a classic and timeless photograph of Venice. 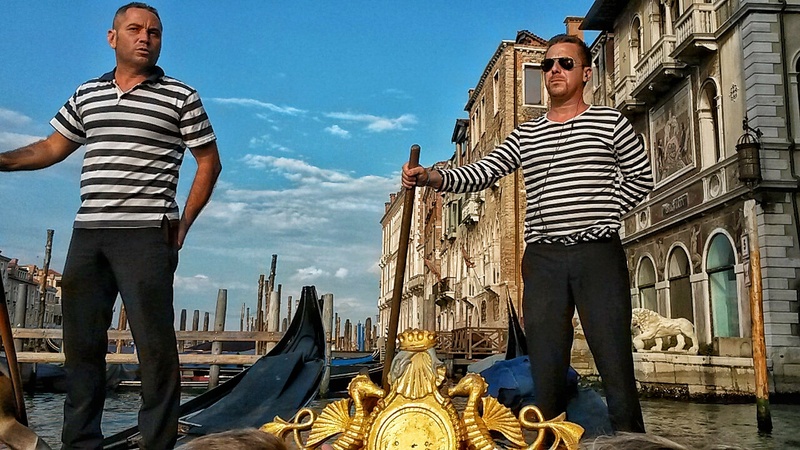 The gondoliers were all dressed in a characteristic stripy uniform and I was impressed at their ability to stand upright and maintain their balance as they propelled us along the docile waters. Our ride lasted half an hour and shortly after commencing the journey, the musicians in a neighbouring gondola started to work their magic with the melodies of the accordion and a grey-haired Italian singer proudly exhibiting his range of pitch. I have always seen images and clips of singing gondoliers in Venice in films and TV programmes but funnily enough, despite the abundance of gondolas we had seen in Venice, this was the only musical one I had actually come across during my trip there. For those of you unfamiliar with it, Tinggly is a treasure-chest of a gift experience website, offering exhilarating and inspiring experiences all over the world with everything from snorkelling in Iceland and wine tasting in Chile to parasailing in New Zealand and horseback riding in California. For one set price, you can purchase a Tinggly gift box for someone special (or heck, even for yourself if you are feeling the urge to pat yourself on the back!) The voucher is then redeemable against any of their gift experiences across the globe with a two-year shelf life. For travel addicts like myself, those of us who favour memories over materials and even those of us keen to try out new experiences in our own cities, this is the place to resolve those gift dilemmas! Have you ever been on a gondola ride and what was your verdict on it? We were guests of Tinggly but I am an opinionated, little, hopeless romantic and all views, good or bad are entirely my own. I couldn’t talk the hubby into a gondola ride either! love the sound of the music floating across the canals, how romantic! Hehehe Emma, why of course Emma, only for research purposes! I’m chuckling away just trying to picture it – I’d pay him a good sum of money to get through the experience without a cynical / grumpy / laughing face! Haha, your description of Pumpkin made me laugh. Mr A is exactly the same – last night I came home and he was de-scaling the kettle for me! It’s the little things that count 😉 Glad you still got to go on your gondola ride though – it looks lovely and I’ll definitely be checking out the site, such a good idea for honeymoon presents for friends! Haha, I’m also I bit of a romance cynic – anything remotely cheesy and I’m off! I went to Venice on my honeymoon, but decided to save the 80 euros I would’ve spent on a gondola and used it to buy bellinis at Hotel Danieli instead! Oh I laughed at your description, my husband is definitely the romantic– I’m the one who’s not! I would love to go to Venice but it always seems so touristy–but, as I have to remind myself, that doesn’t mean it is not worth seeing or not worth doing. I’m so glad you had fun on your gondola ride, it looks absolutely charming. Yes gondola rides are pricey for what they are Natasha, there’s no doubt about it and that’s exactly why Pumpkin (and many other friends and relatives of mine) have opted out of trying it out in Venice. Glad you liked the sound of the gift boxes though – I think they’re such a great idea for any travel enthusiasts out there who are normally otherwise difficult to buy for! He leaves creme eggs for you! That’s true love. Also, if I got to Venice I now know to bring a black mask with me, those gondolier dudes need a Hamburgler makeover and my blog needs that photo oop! Hehehe, I sort of regret not buying a Venetian mask Frankie – but then I tried to remember the last time I actually needed a mask – and I’m not sure it was even in the last decade….unless of course, it’s socially acceptable to just wear one out to dinner in London?! 😀 And yes, he does intermittently leave Creme Eggs in the kitchen – I will happily take this over big swooning romantic gestures any day!! It should be socially acceptable. More masquerade dining, I say! Pumpkin sounds really rather wonderful if you ask me 🙂 What a romantic experience! 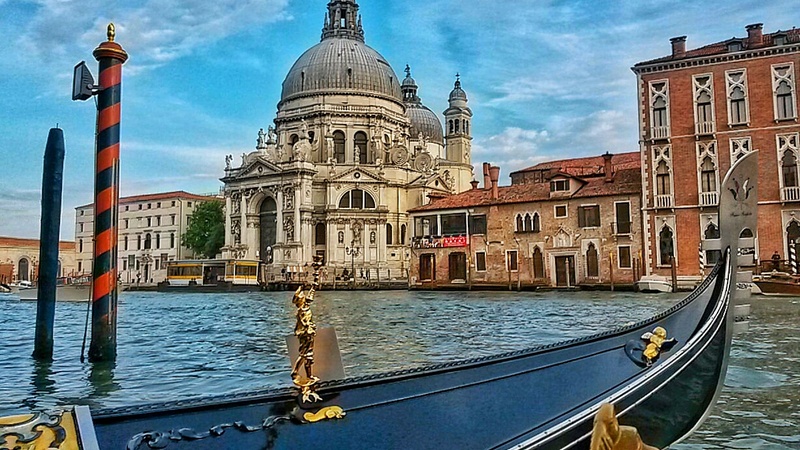 You have me yearning for Venice – I have to go one day!! I don’t think ‘Value for money’ has ever been the most romantic phrase, thank god for tinggly coming to the rescue! 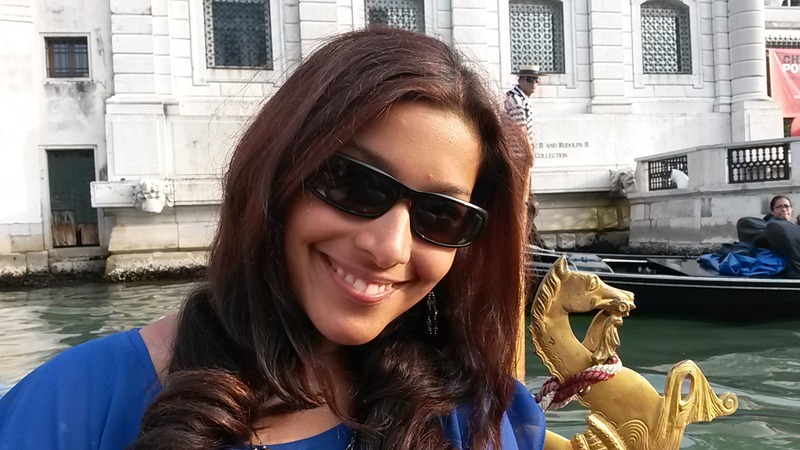 It is cheesy and touristy but when in Rome / Venice! Hehe, yes that’s exactly my point Angie – he’s not one for romantic phrases and words at all – his rather big, heart manifests itself in more practical ways, which suits me just fine, as it’s the ying to my yang 😀 And yes, totally glad I tried out the gondola, would have been perpetually wondering about what it’s like if I hadn’t! So glad you were able to experience the gondola ride with your honey even if it was with other people 😉 We did the gondola ride with our kids last year and while the three of us enjoyed it despite the rain my husband thought it was a little overrated and swears he won’t do it again when we go back to Venice. 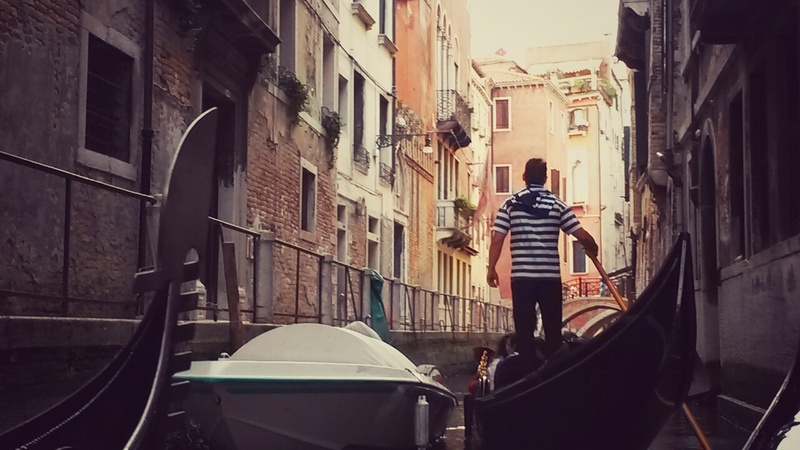 Our gondolier barely talked and no singing either. But, I guess you need the silence to fully enjoy passing through those bridges and canals. Hehe, your hubby sounds quite similar to mine then with the gondola Mary! I’m glad you and the kids enjoyed it though ☺ I’m glad I had a chance to try it out whilst in Venice though as I was so curious! Thanks so much for reading! Nah! You simpky couldnt go to Venice and not take a gondola ride. no way! Thanks Andrew! I’m glad you support the cause – my hubby was a lot harder to persuade! I like to think of it as him “re-defining” romance – to be fair to him, I can organise a swanky dinner myself but no way I could put together a dressing table 😀 I’m glad you tried a gondola ride too – it is one of the must-try experiences out there! It’s really pretty isn’t it Katie?! The waterside canal views were by far my favourite way of seeing the city, more than Piazza San Marco and that region! Pumpkin is going to hate hearing this but building someone a new dressing table without being asked is pretty darn romantic in my opinion! I know the gondola is classic tourist fodder but I still think it just has to be done in Venice… I bet the FLOTUS would have made Mr O do it too! Sometime those touristy things have to be done… I know we’re always chasing the new, different, off the beaten track things but I do have a fondness for the tried and tested… even if it’s just to see for myself if they’re any good! Hehe, Yeh this ride was fun though it would also be nice to try the more romantic private one – though I really don’t know if I could convince Pumpkin to go on a gondola twice! You guys are the same way about D and I! Sometimes I wish he’s more romantic, but I know he shows it in his own ways. I think anyone who leaves chocolate out for you or assembles a dressing table without asking is a keeper! I’m glad you had the opportunity to take the gondola ride after all! I will just have to vicariously live it through you, as D would in no way shell out money for these kind of activities! Hehe, I remember reading one of your old posts about how D was romantic in his own special way rather than the conventional textbook way and I remember saying back then, how much I could relate to that because it sounded so similar to Pumpkin and I so believe me, if I’d have tried to persuade him to fork out on the far more expensive private musical gondolas complete with roses and champagne, I’d have been fighting a losing battle, I have no doubts about that!